Babal is a alternative French model from suicidegirls.com. She has blue eyes, is tattooed and pierced and currently wears a sidecut. She has more green eyes here in my painting, because the original photo was done outside and light made here eyes look more green. Babal from suicidegirls.com a French alternative model. 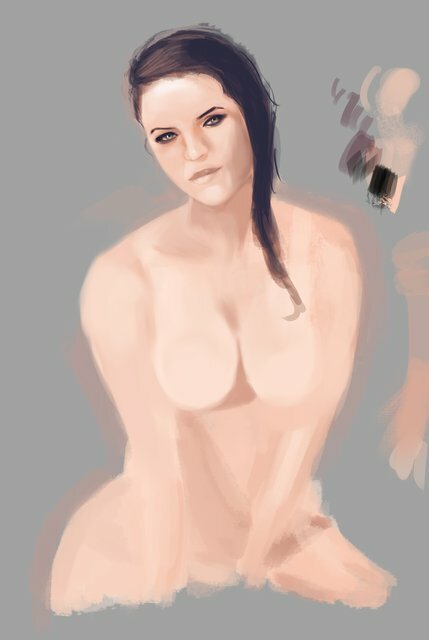 I had real troubles at the beginning to get her face correct, now it looks already really like her. I started to paint the water here, from distance this looks already pretty good. She also has a huge tattoo on her left arm, which I haven't started yet. I changed here eye colour to blue. Almost done, I already like how the water turned out. Babal from suicidegirls.com. I even made the tattoo on her arm. It has less detail in my painting but it still looks really like the original one.